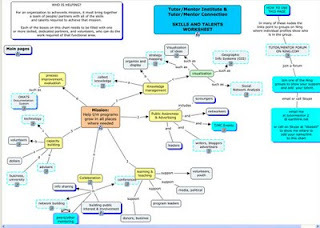 Tutor Mentor Institute, LLC: Network Building - Who Is Helping? 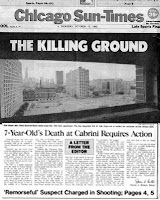 This was the front cover of the Chicago SunTimes in October 1992 when I formed the Tutor/Mentor Connection. 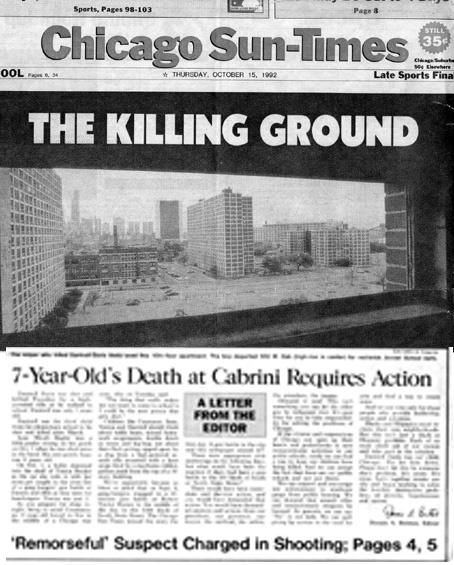 The editorial writer says ending this violence is "everyone's responsibility". For 18 years I've been reaching out to build a team out of "everyone" who would work collectively to make more and better non-school, volunteer-based tutoring, mentoring and learning centers available in all high poverty areas. Due to recent changes I am creating a new organizational structure to continue this mission. It's called Tutor/Mentor Institute, LLC and is based on the ideas I've been sharing on this site and this blog for over a dozen years. This is not a non-profit structure so the challenges I face in building a team of people to help me are different than when the Tutor/Mentor Connection has a non-profit status with the Cabrini Connections program. I intend to build a new leadership team and re-establish the T/MC as a Chicago non profit, but that will take up to a year. By creating the Tutor/Mentor Institute I can continue to support the T/MC web sites and can offer my expertise to help similar networks grow in other cities. So "who is helping?" That's a question people have asked me for many years. I'm connected to so many people, and the way people help is often in short term bursts, that it's always been difficult to describe the range of help offered. So I've created visualizations to demonstrate this and I continue to look for volunteers who can convert these into interactive Social Network Analysis maps. 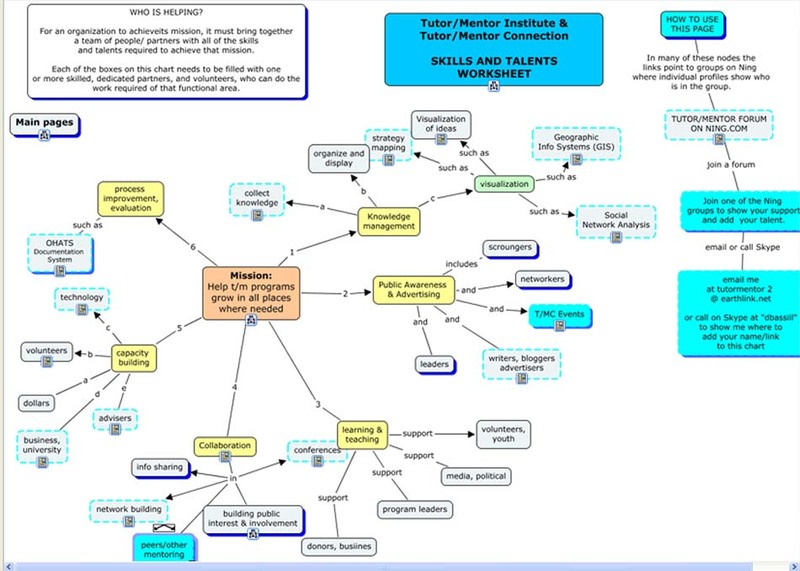 This graphic shows the range of talent needed in the Tutor/Mentor Institute and in almost any innovative social enterprise. You can see the live version here. If you click on the nodes at the bottom of the different units on this map it will take you to groups on the T/MC Ning site where you can see people who are "members" of that group. You can also see links to Twitter, Facebook and Linked-in pages that point to groups of people, or individuals who are working more closely with me. Ultimately a visitor should be able to click on any of these boxes and find names, profiles, discussion groups filled with people who are working in various ways to help the Tutor/Mentor Institute achieve its mission. Right now few of the boxes are filled and updating this map is a time-consuming process. 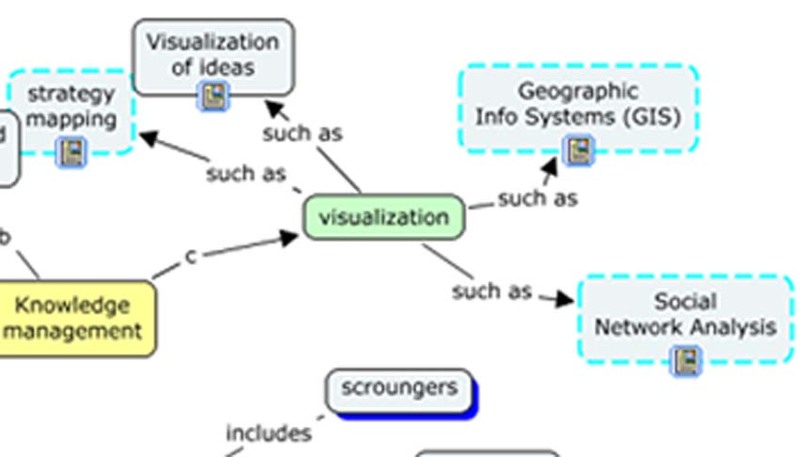 While my maps are built using power point and a free c-map application, this video shows how networks can be visualized using emerging free applications. I'm trying to apply this technology to show the growth of the T/MC and the different constellations and networks of people within the network. I just need to find the talent, time and/or investment to build this. However, if you are already working with the T/MC or want to help me help volunteer-based tutor/mentor programs reach more inner-city youth in Chicago and other cities, you can show your involvement just by joining one of the Ning groups. As you take an active role, it will be demonstrated by the work you do in each group. For those who want to go to another level, you can even join the OHATS group on Ning and become a recorder to document your actions. "Rome was not built in a day" is a saying that implies the long term effort to build anything that is great and stands the test of time. This map will not fill in in a few months and might take years. However, as it does fill in with partners, volunteers, investors and leaders who share the same vision what we do to change the path from birth to career for youth living in poverty will dramatically change. Hey Its really good job buddy you are giving the clear cut ideas on Social Network Analysis which has become the backbone of our society .